Come see Aviacode Booth #402 at AAPC HEALTHCON 2018 to learn about how we can help Improve Efficiency, Increase Revenue and Strengthen Cash Flow. 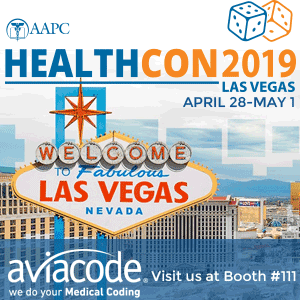 Come see Aviacode at HEALTHCON to learn about medical coding job openings and how we can help your organization improve efficiency, increase revenue and strengthen cash flow. Set up a meeting with us. We’d love to talk with you.